1. 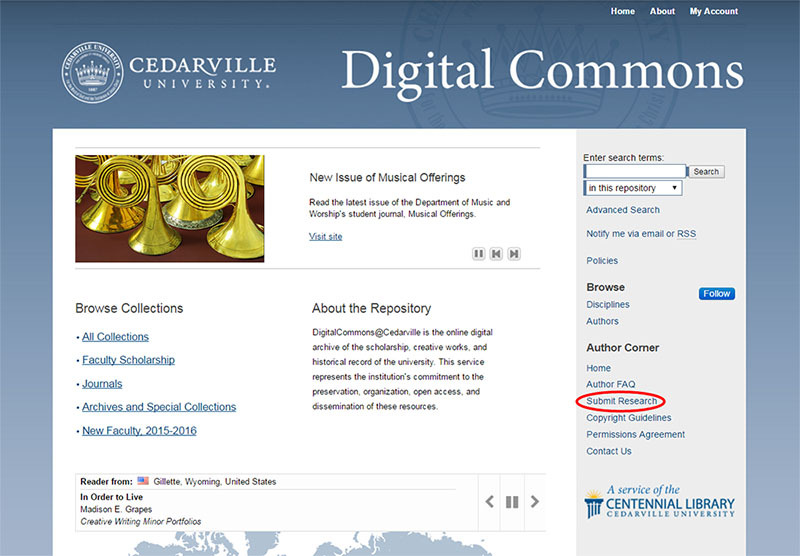 Go to DigitalCommons@Cedarville or type http://digitalcommons.cedarville.edu/ in your browser's address bar. 3.You will need to create a new account. Click Sign up to start. 4. Fill in the required fields and enter Cedarville University for Institutional Affiliation. Click Sign up. You will receive an email to confirm your account before proceeding. 5. Once you have confirmed your account, click on Submit Research in the blue column near the bottom. 6. 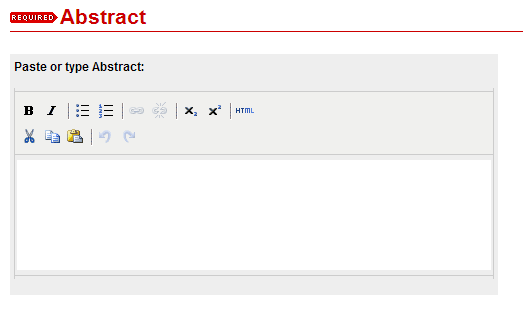 Scroll down on the screen and click on the appropriate category for your thesis or project. 7. Read through the Submission Instructions and Submission Agreement. Check the box to agree and click Continue. 8. Enter the title of your thesis. 9. The author field should automatically have your name and email based on your login. 10. If you did a thesis, select the date of your defense. 11. Select the date your degree was awarded. 12. Type in the name of your advisor. The Second and Third Advisor fields are optional. 13. Enter some keywords that best describe your topic. 14. 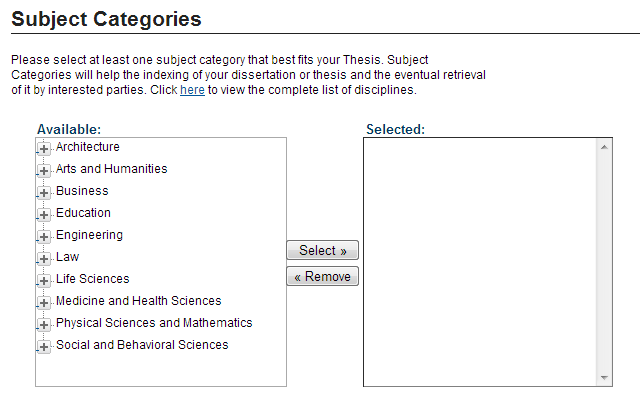 Select at least one subject category for your thesis. Education is selected by default. You may select multiple categories. 15. Cut and paste the abstract from your thesis. 16. The Creative Commons License defaults to the one we recommend. You can read more about the licenses by clicking on the link. 17. Choose the Upload file from your computer option and Choose File to upload. 19. Look over the information and make sure everything is correct. If you need to edit anything, click on the Revise submission button. 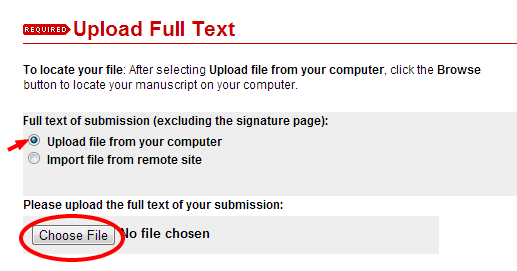 You can log in to your account and make revisions up until the paper has been publicly posted to DigitalCommons. Your thesis will not be publicly available until we have received confirmation from your school.